Many allies are looking for a good way to explain why they're an ally and we've got a solution. Download one of our "I'm an Ally Because..." cards, print it out, fill in your most important reason for being a ally to people who are LGBTQ and put it someplace visible. Use it to get a conversation started! Are you LGBTQ? Don't feel left out. We've got something for you too! Download the "I Need an Ally Because" card to offer people around you something to think about! Want to go even further? Download one of our "As a trans ally I will" card to move from identifying as an ally to openly showing your support for the transgender community! 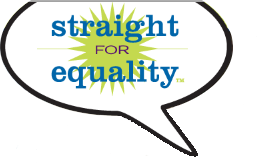 You can also take a photo with your card and submit it to the Straight for Equality Team at info@straightforequality.org to participate in our ally visibility efforts on Facebook!